These guys came out of nowhere, and after seeing what they have to offer, it's hard to believe they sneaked in under the radar so unnoticed by many. 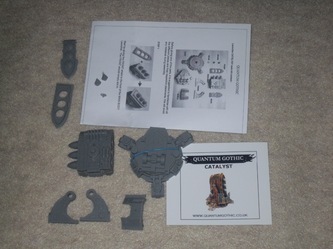 Quantum Gothic is a new company from the UK which offers resin sci-fi scenery/terrain pieces. 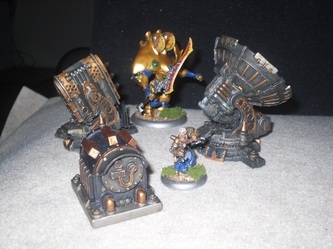 First up is the Catalyst/Missile Launcher platform. The first thing I noticed was how clean, and even mold-line-free these pieces were. Resin models tend to sometimes end up with bubbles in the pieces, which need to be filled with some greenstuff. My experience with ForgeWorld resin pieces is that there's almost always excessive flash and mold lines to clean up too. Not with this kit. Only the very tiniest pieces, like the two spikes had any flash on them. I found one micro bubble too, and it was in a place that was the inner-facing side of a piece, so it's in such a place that it doesn't matter, because no one will ever see it. Clean up and assembly was quick and painless. Assembly is a cakewalk too. They include a very nicely laid out, and finely detailed set of instructions. ForgeWorld could learn a lot from Quantum Gothic in this department. While it is no more than a PC printer generated piece of paper folded nicely... it's still how the information and images are presented that count, and things couldn't be any clearer. A tiny dab of glue here, a little holding there, and the entire model took no more than maybe 15 minutes to build right out of the package. I was watching TV while doing it, and taking my time even. There's 11 pieces in all, so it wasn't like performing brain surgery either. The base is two pieces, and I didn't glue the top piece to the bottom either, so that I can turn the launcher assembly, as there's a stem leading into the bottom, and a circular tongue and grove to allow the unit to rotate 360 degrees freely. You could glue the entire thing in place, but it sits just fine without doing so, therefore I left it alone. Overall, I can see why the TGN guys voted this Best Terrain/Scenery piece of 2009. It really does look amazing once assembled, plus it's a very clean and easy to build model. They recommend it's for ages 15 and up, but I truly believe my 9 year old twin girls could have put this thing together, it was that simple by design, and the detailed instructions they include help to keep it simple. This was an interesting looking piece, so I had them send it along too. This is a 7 piece kit, and was just as easy and carefree to prepare and assemble as the Catalyst. Flash was only present in the tiniest form on the 4 bolts for the base of the unit. Otherwise, a good once over with my hobby knife, and this kit was ready for assembly. This one is easier than putting together a plastic GamesWorkshop space marine. Simply glue the two larger circular plates to the main body, then the four bolts that look to bolt the entire unit down to what ever you're using for the ground. That's it, and the piece is done. There's not a lot to say about this one. It's a really nice looking generator. 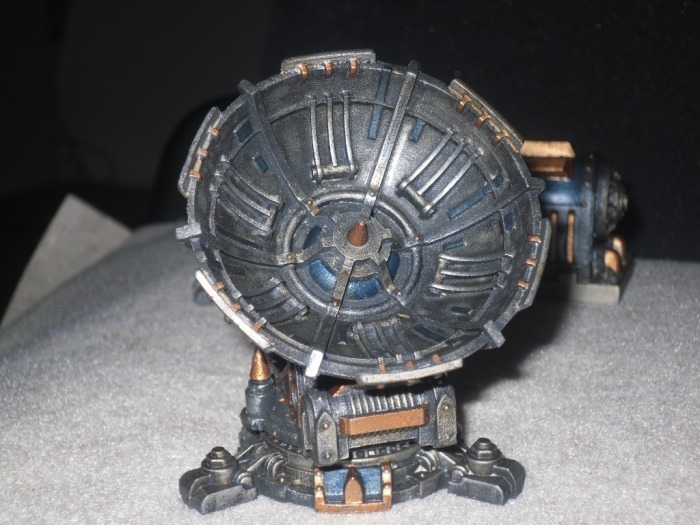 It would make a really cool objective marker. 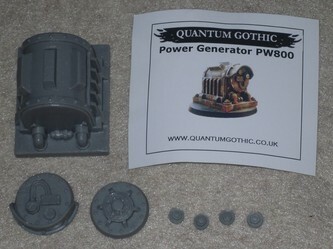 Quantum Gothic suggests using it to pretend to power their ForceField Pylon pieces that they also offer. I just liked how it looked, and thought it would look cool on the battlefield somewhere. It's the smallest piece of the bunch, but just as detailed. Being able to see a needle on a pressure gauge that's smaller than a pea, make it just as nice as the rest of the pieces detail-wise. This is the biggest piece of the bunch, and is made up of 9 pieces. 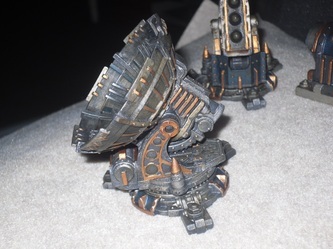 The radar/com dish is what makes it bigger, as many of the base pieces used in this kit are identical to the pieces found in the Catalyst/Missile Launcher kit. Therefore assembly for the most part was just as simple, because I had already built the other kit. The instructions were just as detailed, and to the point, like those that came with the other products too. My only gripe with this kit is that the radar/com dish had a fine mold line going around the outermost circumference of the entire dish, right along the top edge. It was a little bit of an annoyance get rid of, but I managed. That aside, there were no more flash or mold lines than any of the other kits, which is again surprising to me for being a resin kit. 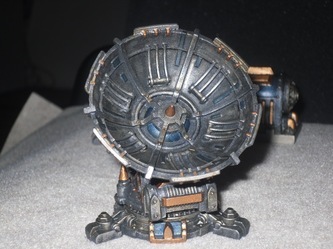 Essentially the base is identical to that used in the Catalyst, so it too rotates 360 degrees, and I didn't bother gluing it in place, so that it could move freely. There's also teeth/cogs that I could have tried to modify to allow the dish to move up and down freely, but I once again just decided that gluing it in place worked just fine for me. Once glued in place, I also found that I could still reposition it anyway without a problem. My experience with resin models is limited to the kits I used to own from ArmorCast, ForgeWorld ,the tanks from Flames of War, and a few odds and ends from other makers, but the bulk of my resin experience is with the ForgeWorld stuff. 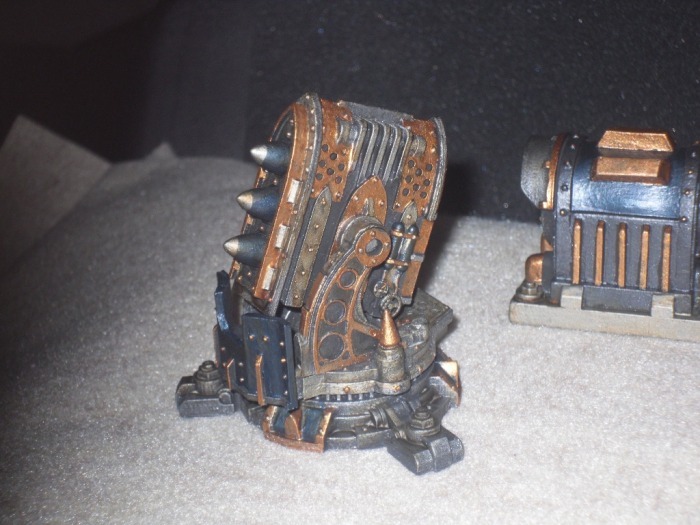 I've owned a lot of ForgeWorld pieces over the years. My experience is that while FW has some amazingly sculpted, and really nice looking pieces, but their stuff is usually the absolute worst stuff to clean up, and prepare to build. This has not been the case at all with the Quantum Gothic stuff. Even the ArmorCast stuff I've owned in the past, had more minor clean up than this stuff. They evidently take a lot of time to make sure they're putting out only the best pieces. As I said earlier in the article, ForgeWorld could really stand learn quite a few things from Quantum Gothic, starting with the instructions department. It also raises the question of...How can a much smaller company, manage to offer resin kits that are 10X cleaner and almost ready to go out of the box, which look as good or better than the bigger companies stuff, at such a reasonable price too boot? 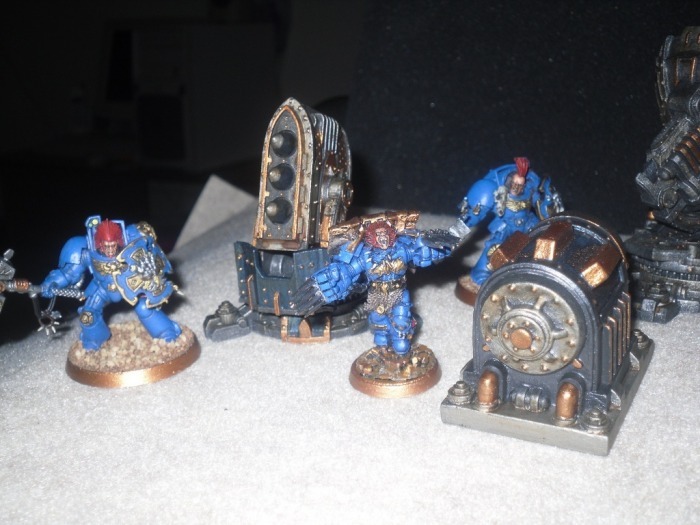 Guaranteed if the Com-dish or Missile Launcher were ForgeWorld kits, they'd easily cost $50 or more each. Scale-wise I'd have to say that these are about 25mm-28mm-scale pieces, so they do look good with Warhammer 40k figures, MERCS Minis, and probably other sci-fi pieces in, or about that same size range (maybe Infinity, AT-43, etc). They do have a sci-fi gothic feel, but I also get the cyber-punk, and even a little steam-punk vibe with it too. With that being the case...I see no reason why the pieces I reviewed couldn't be used in Warmachine and other games as well. The Quantum Gothic stuff also looks to have a place among the alternate universe/pulpy WWII what-if games out there too. There's really no dead giveaways that distinguishes the true scale of these either at a glance, so I'd go out on a limb and say that these pieces very likely could be useful in 15mm scale Sci-fi gaming too. I guess the pressure gauges would define the scale somewhat, but during the cleaning and assembly process, one could easily file those down too. Aside from that, I don't think there's much else to clearly define the scale. This is a good thing too, because the more games I can use scenery/terrain for, the more I like those pieces. It's clear though that Quantum Gothic's core audience is the 25mm-28mm andWarhammer 40k crowd, because many of the other pieces they make and sell, are fortification-line-type walls, gates, tank-traps, towers, and even force-field pylons. 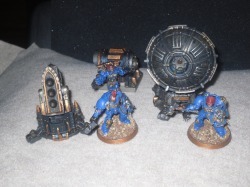 These are all items that the 40k crowd utilizes for PlanetStrike, and 40k in general. This is the reason I asked to review the pieces we covered, because I felt that those pieces specifically could be useful in more than just 40k alone, and upon closer inspection, and after seeing the pieces first-hand, I was right. Cost-wise the pieces themselves aren't terribly expensive. Doing the money conversions it seams the Com-dish and Missile Launcher pieces would run about $25 each in USD, and the Generator about $13 USD, all of which is really fair for such nice pieces. That puts them right in line with the nicer ArmorCast pieces cost-wise too, which is reasonable. 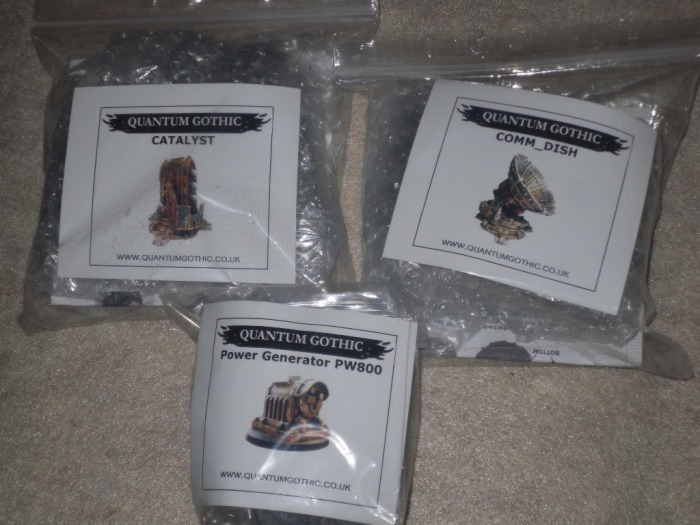 Quantum Gothic ships worldwide too, so you could order from them from the US. They already list two online retailers in Germany and Australia, with more to come too. Since they are fairly new, I'd expect before long that US online, and brick and mortar retailers will see the stuff, and ask to carry it too. They'd be crazy not to. All in all, it's good stuff, check it out for yourself. WarGameGuru - Want to tell us a little bit about how Quantum Gothic was formed? 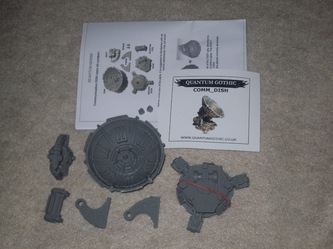 Roberto - Quantum Gothic was formed about 2 years ago as a hobby out of a passion for games, a noticeable lack of cool dark sci-fi scenery kits around, and a self-placed bet called "...bet I can do better "...! The first piece to be sculpted (or more precisely hand-built ) was the straight section of our actual Armoured Wall set. WarGameGuru - How do you go about deciding on what piece is next to be made? Roberto - Fortunately here at Quantum Gothic it's never an issue of 'what should we do next ?' but rather 'which one out of the hundreds of available ideas' best fits our upcoming schedule, available resources and the tabletop gaming trends. WarGameGuru - Where do you get your inspiration when designing a new piece? Roberto - Every week dozens of ideas/sketches are generated and piled up for future use in our range. The style is strongly sci-fi-gothic so anything from Gothic architectures to massive real life machines are taken into account when designing our products. Our purpose is to produce a dark, but slightly more functional feel and look of 'constructs'. Roberto - Once happy and agreed on, the idea to make the next stage is to plan and design the actual kit: complexity of the parts, level of detail and number of required parts to make up the kit will usually be the main issue generators. Once the kit is approved, we start with generating an actual 3D computer generated model of it: at this stage the idea can go through various stages of redesigning and some elements can and will change if necessary to make it fit within the limitations of the real world. So this is actually the most important stage of the whole process. process, all the way to finished product? Roberto - At this stage we would be ready for a 3D master generation of the designed kit. However, because this is a process that can take from 1 to several long days - depending on the level of detail, complexity and number of parts to master - we will decide if to go straight into master generation or prototyping. Prototyping involves a much softer type of material - usually machine-ready foam - which allows for rapid generation of 3d shapes. We use a 3D milling machine for generating masters ( original parts ) and can be very time consuming setting up the various projects. than what I've seen, from say ForgeWorld. As a small company, how do you manage to create resin terrain that's not riddled with flash, bubbles, and is just cleaner to work with out of package than some of the stuff from the larger companies out there? Do you end up throwing a lot of pieces away? Roberto - It's rare we get a piece which needs throwing away. I think if you care about what you do, and especially about your customers you'll find that it's not that hard to manufacture clean 'straight' pieces for your kits. All our casts are checked and then packed, no matter how much work we have to go through: we much prefer receiving an appreciative email from a happy customer rather than a complaint because of the struggle to try and put the two pieces together. maybe 15mm WWII, or some sci-fi space terrain later on down the line? Roberto - Don't think so. Not at the moment anyway. from Quantum Gothic, or are you solely sticking with the terrain/scenery market? Roberto - Definitely! We have already approved and scheduled the development of some serious looking vehicles which - at least one of them - should hit the news before the end of the year. As for the Quantum Gothic figures: yes, we have plans and most importantly numerous sketches ready to be pushed to the next stage. WarGameGuru - Are there any plans to get US distribution, and to branch out into other countries as well? Roberto - At the moment we sell and ship out to all countries mainly through direct sales. We have a handful of shops which stock our products while we constantly receive numerous enquires from new shops. As for a distribution deal: we have come across a couple of proposals in the past but we are still waiting - not looking - for the real deal. We're doing well so far, so we're under no pressure to make one at the earliest. We'll see. 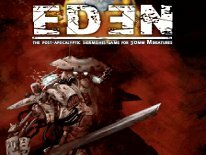 WarGameGuru - What are the long term goals at this point for Quantum Gothic? Roberto - To develop and publish our very own Quantum Gothic game system. We have already a few drafts complemented by tons of sketches, and innovative game concepts. However, this is a long term project and commitment, and it will be some time before we'll mention it again. Roberto - The main idea behind the Quantum Gothic scenery range is to produce modular kits, which can be every time arranged so to create a new scenery every new game. We like to design, and produce dynamic structures instead of the usual glue-and-forget type of kits. We like the idea of a returning customer, because he/she needs more cool 'modules', rather than simply more kits because the ones already glued cannot be used in certain game scenarios.